The region of Dover is a coastal town which has a major port close to Kent. The town is a crossing a point between England and Calais in France. There is a lot of maritime evidence which shows that Dover has been a place which has been used by people for travelling to and from the continent. However what it is best known for is the evidence of fossil which is found in the place and it predates that of human interactions by several millions of years and has always been full of fascination. When looking into the east of the town towards the St Margaret’s Bay one can find the famous White cliffs of Dover, which has the middle and upper chalk which dates from the Late Cretaceous epoch going back to over 85 million years of age. During this period Dover was submerged in water. The fossils which have been found shows the prehistoric sea creatures preserved, which has been found in sediment. Examples include sponges, bivalves and other marine organisms like sharks and crustaceans. One is able to access the cliffs through the hill top, from which it is a fair walk along the coast to Langon Hole. During the late cretaceous era the global sea levels were over 200m higher. The higher sea levels could be due to a combination of extreme greenhouse conditions and heightened plate tectonics. When the global high temperatures were experienced, there was a greenhouse effect. This elevated the ocean level displacing water further into the continental shelves. The chalk is mainly made of skeletal remains of planktonic algae called coccolithophores which accumulated to form a white ooze on the floor of the sea. It was this soft sediment which later compacted and lithified to form chalk. In the present day this chalk is above the sea level and is has also been subjected to intensive erosion and sculpting into a vertical cliff face. 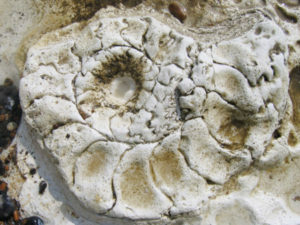 When looking into what one might find as fossils, it is seen that the area is rich in, sea sponges in the inorganic flint and the siliceous planktonic microorganisms like diatoms and radiolarians. The flints are concretions which have a growth within the sediment after its deposition by the precipitation of silica. It can fill burrows and envelop the remains of marine creatures prior to dehydration and hardening into microscopic quartz crystals which constitute flint. It is quite common to find the fossilised evidence of these animals preserved as flint especially the internal moulds of micraster echinoids.